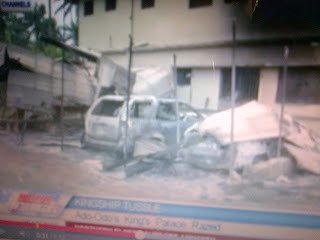 Angry mob burn Oba’s palace, cars in Ogun State, this is according to Channels TV report. There was mayhem on Monday in Ado-Odo, Ado-Odo Ota Local Government Area of Ogun State when a traditional ruler, Oba Lateef Adeniran was attacked and stripped naked by some hoodlums who also set his house and cars ablaze. 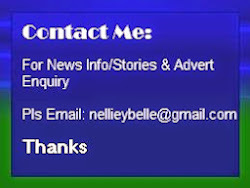 Some members of the community who spoke with journalists alleged that the king was imposed on them by the past administration but insisted that peace can only return to the area with the installation of a king generally accepted by the people. The palace was also destroyed while his wives and children escaped being lynched by rampaging residents during the violence that ensued following a Supreme Court judgement. It was gathered that the attackers were protesting the validation of his appointment by a Supreme Court judgement delivered in January 12, 2009. The protesters forcibly stopped the jeep conveying the King and dragged him out of the vehicle before they started beating him and then striped him naked. According to eye witness account, the mob did not meet the monarch when they arrived at the palace hence the setting of palace ablaze. His parked cars were also destroyed. Oba Adeniran is reported to be currently receiving treatment in an undisclosed hospital in Abeokuta, the state capital for the injuries he sustained on his head and other parts of the body. The monarch’s wives, children of the monarch and the palace staff were said to have sustained injuries during the riot. The commanding officer, 182 battalion who led other security operatives on a rescue operation told journalists that those injured have been taken to the hospital for treatment. Confirming the incident, the Ogun State Police Public Relations Officer, Muyiwa Adejobi said that the police have restored order to the town. Adejobi, a deputy superintendent of police assured that all those involved in the attack on the monarch would be apprehended and brought to book. Meanwhile, the Ogun State Government has appealed to the people of the community to shun violence and maintain peace.